Welcome to September’s Oven of the Month. Congratulations to our winners this month, Mark & Clare Terry for their Vento 100 kit oven! Mark and Clare have take two years to complete their Vento build but it has definitely paid off. “The reason why it has taken so long is that we have sourced all reclaimed materials as we wanted it to look as if it had always been in our walled garden. 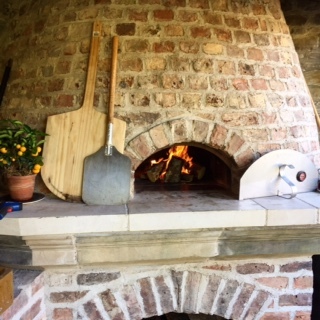 They have sent us several fabulous photos which show part of their building process, the finished oven and the amazing pizzas they have created! Thanks so much for sharing Clare and Mark and we hope you enjoy your pizza oven for many years to come!